Fed up, fat and frumpy? 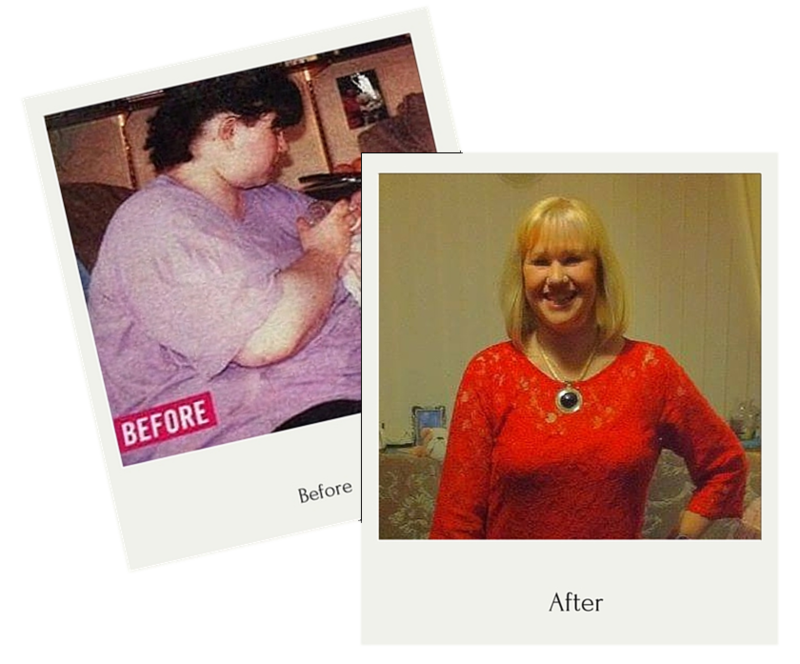 Sammi lost over 10 stone and has stayed on target for 15 years! Sammi joined Slimtone in August 2000. 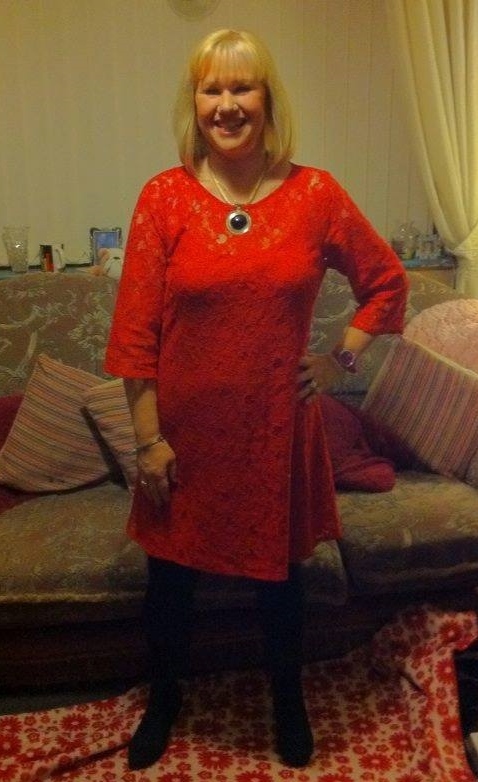 Her heaviest weight was 19 stone 5lbs and she lost 9 stones. “I keep the weight off by exercising to videos and DVDs around five times a week, walking the dog and being very careful what I eat. I have learned how to prepare tasty food that is low in calories and fat – all ideas from my Slimtone Lifestyle Plan. I was very overweight and very unhappy. It was the year 2000 and everyone was going on about making a new start for the new Millennium. I was spending a weekend at our static caravan in Garstang near Blackpool and I was bored. The kids were all busy playing and my husband had gone home. So I headed to the local shop for a magazine. I picked up a slimming magazine and in it was a story about a lady called Debra (I think) and she had lost a lot of weight with a group called Slimtone. I had, I have to admit, never heard of Slimtone, but something about her story just seemed to connect with me more than any of the others. Having three small children and an errant husband, I found it difficult getting out on my own so going to a slimming class was out of reach, that and the fact that Slimtone is based in beautiful Wales and too far for me to travel. So I went online and enrolled. I couldn’t wait for my ‘pack’ to arrive. When it arrived I read everything, went out bought some food scales, body scales, measuring spoons and jug and set to with tape measure in hand. Slimtone just fitted in perfectly with my lifestyle – the recipes were great and even the kids enjoyed them. I combined a healthy diet of 1,250 calories with aerobic videos done five days a week and the weight just seemed to slide off. Unlike other diets, the BIG difference with Slimtone was that this became a way of life. It re-educated me on how to cook and prepare food. But more than that it made me delve into myself as to why I over ate and comfort ate. I started to understand my triggers. My main trigger was how unhappy I was. I was in a dead end marriage, with a husband who was never at home. His attitude was to work hard and play hard – usually with other women which meant I was virtually a one parent family. He finally admitted to one of his affairs and I now had the confidence to chuck him out and start again. I moved myself and my children away to another area and started our new life away from him. I started to socialise with my friends more, I loved being able to buy off-the-peg clothes in “normal” shops and my confidence soared. I invited an old friend round and he came to see me with his mother, who was a friend also. He admitted he had always liked me and we became a couple. In January 2003, we were looking forward to getting married in the August. Then disaster, my mum was diagnosed with breast cancer. It was a blow but we managed through Christmas. In January, Pete and I decided to go for a hike to blow the cobwebs away. It was a beautiful crisp winter’s day, a covering of snow on the ground, bright blue skies, breath-taking! We hiked up to Darwen Tower, had lunch overlooking Blackburn and Darwen, then started the descent. There was a steep hill, Pete went down via the grass and I chose to go down a cleared path. Suddenly I caught my right foot in a rabbit hole – there was a blood choking snapping sound and I realised it was my leg. I fell and, as I looked down, my heel was where my toes should have been! I suffered a Pott’s fracture. Mountain rescue came and carried me down the hill on a stretcher to a waiting ambulance and I was taken to Blackburn Royal Hospital. They tried to reset my ankle but did not do it very well. My mum was an orthopaedic nurse in Bolton and arranged for me to be transferred. Mum helped the surgeon reset my leg in A & E and I was transferred to the ward. Two days later I had an operation to pin and plate my leg back together. It meant three months in a wheelchair. Frightened that I may gain weight as I could not do my beloved aerobics, I found a video with a section on wheelchair aerobics, so I still managed to do my exercise and keep in shape. I am determined. While I was recovering, my Mum had an operation on her cancer and my Dad had a massive heart attack. Then my sister ended up in hospital having her gall bladder removed. At the time I was still in my wheelchair and still kept up with the visiting – a wheelchair really tones your arms up. After everything, Pete and I finally got married. It was a gorgeous day. I had designed the dress myself and had a lovely lady make it up for me. Two of my three children, Joey and Shanley, have a condition called Albinism, which effects their skin, hair and eyes. When Joey was diagnosed as a one year old, I asked the consultant for information on the condition. He said that ‘there may be a leaflet in the waiting room, and he won’t be able to drive’. That was it. There was no leaflet, so I headed off to the library, but there were very few books on the subject and I had to muddle through. Because of the lack of knowledge, even within the local medical profession, I decided I should do something myself. I bought some web space and designed my own website. The website and support group has gone from strength to strength. When I told the consultant what I had done, he was very impressed and gave me his media contacts, telling me to call them and spread the word. I did and have never looked back. As a result of the website, I’ve written hundreds of newspaper articles on Albinism and talked many times on the radio. I have done radio shows on Insight Radio, a radio station based in Glasgow, and on the internet for people who are partially sighted and blind. I have done interviews on Bolton FM a local radio station. I was even invited to do a show on Channel 4 called Doctor Doctor and helped to make a documentary for Channel 4 called Britain’s Whitest Family. All of this was down to Marie Griffiths and Slimtone. If I hadn’t discovered Slimtone, I would not have lost weight and I would not have the confidence I have now. My confidence has enabled me to set this website up and help other people. In 2008 and again in 2009, I was involved in two car crashes. The first meant I needed intense physiotherapy and I didn’t do aerobics for 4 months which drove me crazy! The second crash again landed me off my game for a while. But I’ve bounced back. I’m now back to my physical peak and enjoying every minute of it. I stay active and keep the weight off. The exercise keeps me toned. My kids now see me as a fit and healthy Mum and are encouraged to exercise themselves – for us all, it’s normal daily life. I recently went to a School Reunion – I was determined to be absolutely toned for it because everyone from High School only knew me as dumpy and overweight. I wanted to look my best to show them how much I have changed! I still love the “little me”. I’ve stayed on target for 15 years – even after everything I’ve been through. Slimtone really did save my life!